So you are ready for your holiday in Moscow and have already planned your visit to the Kremlin, Red Square and The State Tretyakov Gallery? However, Moscow has much more to offer! What better way to know the city than to experience what the locals do? So here is a list of the things that are equally enjoyable for both, Moscovites (people from Moscow) and guests of the city! There are a few places in Moscow where you can watch your favourite film under the sky and … in English! The movies start in the evening as it is getting darker but do not be afraid of cold! The staff will provide you with warm blankets to make your evening cosy and enjoyable. The tickets can be bought at the venue and are no more expensive than the usual cinema tickets. The most popular places are Museon Park and Park Gorkovo. Feel like doing something active and meeting the locals? The free dancing classes on the bank of Moskva river are for you! You do not need to know anything about dancing or possess any coordination skills. Good mood and friendliness are the only entry requirements. The timetable can be found on the website of the park. Rollerblading is one of the most favourite summer pastimes for Moscovites. You can find the stalls where you can rent a pair of roller blades almost in every park in Moscow. We would recommend to head down to Vorobiovy Gory in the south-west of Moscow where you can freely rollerblade by the river and have a picnic in the sun in one of the most picturesque districts of Moscow. What can be better on a hot sunny day than being next to the water? River cruises in Moscow run on regular basis and will give you not only the fresh breeze but also food for thought as they include the tour of the city as well. Want to do something unusual? Then go for the night river cruise with an opportunity to have a fine dinner on board. You can book your mini-cruise with us! One of the tallest building is Moscow is the Academy of Science. Arguably the most interesting thing about the building is that it is not one of the modern sky-scrapers but more a of a soviet sky scraper. The building is affectionately known as ‘the brains’ due to the brain-like construction on top and this is where Sky Lounge is. With a stunning view and a fancy design, the place attracts a lot of couples on a regular basis. Book in advance! If you happen to visit Moscow in summer, pop up to the annual ice-cream festival at Sokolniki! Apart from all sorts of ice-cream that you could imagine, you can enjoy live music and entertainment as well as the rides. Last but not least, the festival is taking place in one of the largest parks of the city, so it’s a good opportunity to combine indulging yourself with ice-cream with a healthy stroll! Not known by many tourist, Kolomenskoye is a hidden gem in the south of Moscow. It is located on the hill, boasting a beautiful view of the city and henceforth is a beloved place of many photographers. If you are coming to Moscow at the end of summer, beginning of autumn you can harvest apples and pears in the gardens of Kolomenskoe! But hurry up, many locals already know this secret! 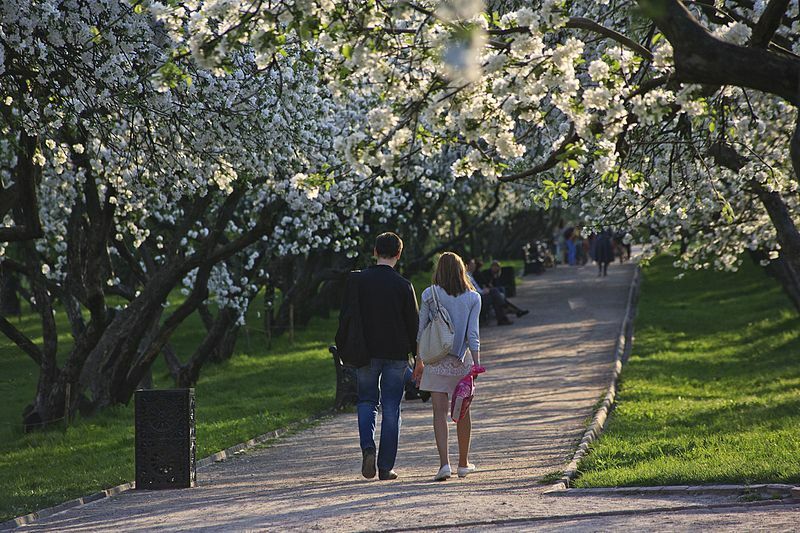 Last but not least is Izmailovsky park – the largest island of green in Moscow. It has a few beautiful lakes hidden behind the trees and a great place to visit on a hot day. If you want to try street food like shashlik, borrow a boat or have a picnic, this is the right place for you. Not many tourists know about the Izmailovsky Kremlin, one of the quirkiest and arguably most beautiful places in Moscow located outside of the park. As a bonus, you will find aflea market next to it, where you can find local souvenirs for much cheaper price than in the busy touristy city centre.